Single figure bases for keeping track of unit casualties. Way back in May 2008, I wrote some SBS postings about how I created casualty markers. Even though a lot of people said kind things about my ideas and I was gratified to see several others adopt them for their own casualty markers, I still had a niggling level of dis-satisfaction with the outcome. It turned out to be pretty simple to work out why I wasn’t happy: I didn’t feel I had the balance right between aesthetics and practicality. The base was just fine as a tool for the job, it just didn’t look very elegant with all those numbers visible around the edge. For more than a year, that’s been gnawing away quietly in the background without me ever hitting on the solution. It’s funny how you can look at something almost every day but not be able to see how to put it right. Then, two nights ago, my sub-conscious woke me up in the early hours with the solution fully formed in my head. I jotted the eureka moment down in my notebook in case I forgot it again and patiently waited for the opportunity to iron out the wrinkles. Take one painted casualty figure and base it on a round base and paint and decorate the base just like you would for any normal base of figures. No numbers, round base – doesn’t sound like much an idea so far, does it? But here’s the bit that that makes the difference – use a shiny material like acrylic for the base or, if you use a wooden base, stick a circle of laminated card to the underside. What you end up with is a casualty figure on a round base with an underside that you can write on with a felt pen of a chinagraph pencil (can you still buy those?) but that is shiny enough to be wiped clean afterwards so it can be used over and over again. Now you only ever need one casualty base per unit regardless of the size of the unit, the number of bases in the unit and the number of figures on each base. The same size of round base can be used for all your casualty markers – which gives a pleasing consistency. But that’s not all, using this method you can choose whether or not you remove bases from the table as the casualties mount for a unit. And finally, because the number of casualties is hidden from view, your opponent has to deal with a more realistic “fog of war” issue when assessing the strength of your units. The next step is for me to produce a prototype that proves this idea works. I’ve already looked on the Litko website and the do indeed supply pre-cut circular acrylic bases. And, yes, I’ve checked, they do indeed still make chinagraph pencils (our Colonial Cousins call them “grease pencils). Anybody else want to try out this idea so we can compare notes? 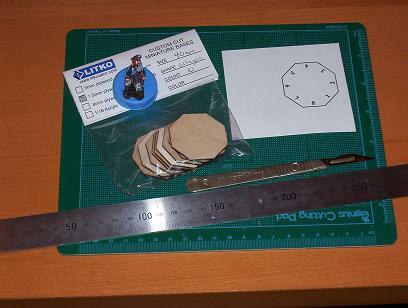 Now I’ve slightly adapted this idea – I’ve gone for a larger 40mm base (DB usually games with 15mm miniatures) and I’ve used octagons instead to reduce the number of casualty markers I’ll need to make. So, how does a finished casualty marker look? To answer that, here’s the one I’ve made to go with the second battalion of the Kurmark landwehr infantry regiment I’m painting up at present. The idea is that I’ll eventually give each unit I paint its own distinctive casualty marker. In part one we reached the point where the overlay had been glued to the base. Now that this has dried out properly, we can move on. We want to protect the overlay from the rigours of handling during wargaming in just the same way that the paint jobs on figures need to be protected. So it should come as no surprise that I used the same varnishing approach for this overlay as I use for figures. The first coat of varnish is a polyeurethene gloss for protection and the second coat is a matt acrylic for appearance. For the gloss varish I use Humbrol clear enamel 35 (which seems to go under a variety of names these days). The important thing to remember is that the varnish needs to be thoroughly shaken and stirred before use. I always keep a seperate brush exclusively for gloss varnishing and I clean it using Humbrol Liquid Poly (yes, I know this is a solvent that’s intended for sticking together plastic kits but it’s a great brush cleaner too). Once you’ve painted the base with the varnish put it aside in a dust-free location to dry overnight. For the matt varnish I use Winsor and Newton acrylic matt varnish. This also needs a really thorough shaking before use. If you do the job properly, you’ll get an excellent flat matt finish – if not, then expect shiny results but these can be corrected with a second properly shaken coat. I sometimes find I need to touch up the bits I missed first time around with a second coat anyway. I dilute my matt varnish with water mixed with a drop of washing up liquid to help it flow better. Again, it’s good to leave this to dry in a dust-free environment but it doesn’t usually need anywhere as long as the gloss varnish before it’s safe to handle. Check the directions on you own preferred varnish for guidance here. When the matt varnish is dry (and assuming that your chosen casualty figure is also painted, varnished and dry) it’s time for some assembly work. I glue the casualty figure to the base using UHU but there are plenty of other adhesives that’ll do the job just as well. Once this is set, you can start adding your basing materials. Everybody seems to have their own recipe for this so go ahead and do whatever works for you. I thought I’d share my approach though, in case it provides any inspiration. Well, it’s not really mine – I learnt it from the late great Ian Stables. He used to use ready mixed pre-coloured flexible wood filler. There are all sort of brands of this type of stuff but Ian recommended Wilko dark brown. If you’re in the UK, you can buy this from Wilkinsons (which is a pile it high sell it cheap hardware chain store). The last time I bought a 1Kg tub it cost £1.49 and 1Kg goes a very long way indeed. Don’t try to use it neat from the tub though because it’s too hard to work. Instead, spoon a dollop out into a mixing bowl and dilute to taste with some water and maybe a bit of PVA glue. once you’ve got a consistency you’re happy with you can sculpt it on to your base, taking care to avoid your figure and the numbers printed on the overlay. I use those wooden stirring sticks from posh coffee shops as my sculpting tools. The great thing about this Wilko wood filler is that it’s a good earth colour already so most of the painting job is done and it has a great texture to dry brush over. I tend to go for a light sandy colour. Lastly you can add anything else you like to spruce up the base – static grass, bits of cat litter for rocks, twigs from the garden for tree trunks etc etc. Next time, I’ll post a photo of my finished casualty marker base for the second battalion of my Kurmark landwehr infantry. It was way back in February that I promised a step-by-step of how I plan to do casualty markers and I’ve finally got round to doing it. Part of the delay has been the usual stuff about life getting in the way but the other part is that I’ve been experimenting with the various ways I might get the numbering on to the bases. I’ve been through a range of candidate solutions including home-made transfers, Letraset and indiviually printed and glued numbers. None of these, for various reasons, have proved satisfactory. A recent re-organization of the family computers and home wireless network proved to be the trigger for the solution I’ve now settled on. The computer in the study now runs Windows Vista and we have the latest version of Microsoft PowerPoint installed on it. This new version of PowerPoint includes octagons and hexagons in its arsenal of standard shapes, which has made it much easier to design correctly shaped and sized overlays for my casualty bases. You might recall that I have batches of 1.5mm thick 40mm wide laser-cut plywood bases from Litko. As mentioned, I used Microsoft PowerPoint to design my overlays for octagonal bases (I’ll do hexagonal ones the same way at some point in the future). I’ve managed to create an A4 sheet of 12 overlays (no point in wasting paper) and each overlay has the numbers one through eight around the edges. And because I’m a nice kind sharing person, I’ve uploaded a copy of this overlay sheet for people to use freely if they wish. I don’t mind any personal non-commercial use of these overlays but please note that I have asserted copyright and I won’t be happy if people infringe my rights for commercial gain. 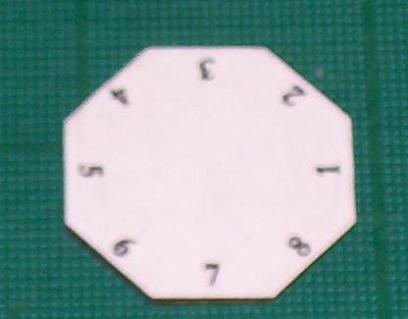 Download 40mm octagonal casualty base overlays. This version of the file is (I hope) backwards compatible with older versions of PowerPoint. I’ve printed off a sheet of overlays using my HP DeskJet printer. I reckon any ink jet or laser printer will do the job. Bear in mind that the overlay sheet is designed for A4 sized paper, so if you’ll have to make adjustments if you’re used to US legal sized paper. Once printed, you can cut out the overlay. I recommend the use of a steel rule and a scalpel to get clean neat straight edges but please take appropriate safety precautions when using sharp tools. A quick and simple step but one that’s well worth the effort. Just inspect your chosen base and clean up any rough edges. If, like me, you’re using Litko (or any other brand of) laser-cut bases, you should wipe round the edges with a clean damp cloth to remove any black soot residue left over from the cutting process. You don’t want this black residue to contaminate the overlay and make it dirty. I use watered down PVA glue for this step. Simply paint a thin film of the diluted glue on the base and slide the overlay into position. Try to keep you hands clean and clear of glue and use a dry towel to pat the overlay firmly down on the base and smooth out any air bubbles (not that I had any problems with these). The idea here is to avoid handling the surface of the overlay as much as possible to minimze the risk of it getting dirty. Now set aside to dry for a couple of hours. Er… Sorry the photo of the glued overlay is out of focus. I’ll try to replace it with a better picture later. Once the glue is dry we’ll move on to varnishing and basing up the casualty figure. More detail about these steps later in part two.